Add a little sparkle to your evening with this lacy shrug! 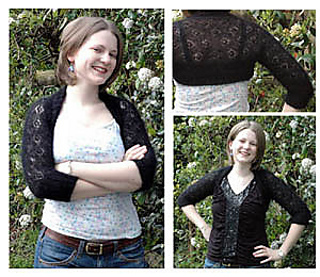 Using just two balls of Rowan Kidsilk Night, the shrug works up quickly and is perfect for a summer’s evening. The construction is straight forward and the lace pattern quite easy to follow. I’m really sorry, but there are a heap of errors in the pattern and I’m going to take it down until I get a chance to deal with them. I’m so sorry for any inconvenience!